I — along with millions of other Americans — won’t sit idly by because inaction is not a solution. One year later, I still stumble over the words. Frankly, I don’t think “my sister was shot in Las Vegas” will ever roll easily off my tongue. I never thought I’d explain to people my sister was “a low-priority gunshot victim,” but then again — this is America. I know we’re incredibly lucky that we don’t have an empty seat at our table for the holidays. And, my nieces are fortunate to still have their mother. We may never be the same, but for so many it’s much worse. I remember everything about the evening of Oct. 1, 2017 — the night my sister and brother-in-law were enjoying music at the Route 91 Harvest Festival in Las Vegas, Nevada. I was getting ready for bed when I noticed a flurry of missed calls from my sister, Katelyn. I immediately knew something was wrong. When we finally connected, through her sobbing I heard her say, “Alicia was shot! Alicia was shot!” I went numb. I scrolled through my Twitter feed, where I saw raw footage, the screams, the chaos. Knowing my sister had been in the middle of it made my heart sink. I did my best to calm my sister and my mom as I arranged for us to fly to Las Vegas the next day. Landing in Las Vegas was surreal. Every driver knew why we were there as soon as we gave the hospital address as our destination. Seeing Alicia lie motionless from a gunshot wound in her back — and surgery to check for organ damage — made it real. I’ll never forget seeing her husband, Nick, broken in a way I can hardly describe. The blood-soaked shirt he used to stop Alicia’s bleeding was in a bag on the floor. He still had her blood dried on his hands. I — along with millions of other Americans — won’t sit idly by because inaction is not a solution. Throwing up our hands and doing nothing will not lead to the change we deserve. I had my “enough” moment when I was confronted with the very real possibility of losing my sister to gun violence. That’s when I decided not to continue to wait for change to happen, but to be part of the solution. In the year since the shooting, I’ve become an active participant in the gun violence prevention movement as a member of the Everytown Survivor Network and a volunteer with my local chapter of Moms Demand Action for Gun Sense in America. I’ve learned that like me, millions of other Americans have had their “enough” moment, and have gotten off the sidelines to demand change. And, it’s working. States have stood up to pass common-sense gun safety laws where Congress has failed to act. In fact, since the shooting in Las Vegas, 11 states — led by Republicans and Democrats — have passed laws prohibiting bump stocks, the kind of device used in the Las Vegas shooting that enables a semiautomatic firearm to mimic the lethal firing speed of a machine gun. I am proud that Washington state was one of those 11 states, and I testified in support of this legislation signed in to law by Gov. Jay Inslee in March. For me, and countless others, this is personal. We must continue the momentum to save lives. We have that opportunity in just a few weeks by electing gun-sense candidates up and down the ballot. It’s critical that we elect candidates who will stand up and take action rather than just accepting shootings on our streets, at concerts, at playgrounds and in our homes. All it takes is three simple steps: register to vote, find out who the gun-sense candidates are in your area by visiting gunsensevoter.org, and talk to your family, friends and neighbors about the importance of electing gun-sense champions. 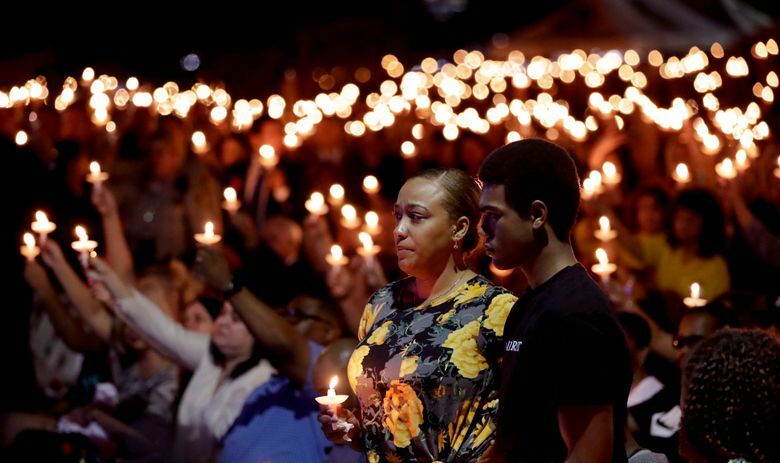 We must take our outrage, anguish, empathy, conviction and — let’s face it — our fear to the ballot box and elect candidates who will prioritize public safety over gun-lobby profits. Vote like our lives depend on it. The shameful reality is they do. Zach Elmore is a member of the Everytown Survivor Network. His sister Alicia Johnston was shot and survived the Las Vegas mass shooting. He lives in Seattle.